Barkzilla: A Savvy NYC Dog Blog: Eco-Capitalism Goes Pet Friendly! Princeton University students Tom Szaky and Jon Beyer drew inspiration for their company from a box of worms. They started small -- first demonstrating the feasibility of their idea by reprocessing solid waste from dining halls at Princeton University -- before tackling bigger challenges. Today, TerraCycle is a case study of eco-capitalism success and demonstrates that "a company [can] be financially successful while being ecologically and socially responsible." 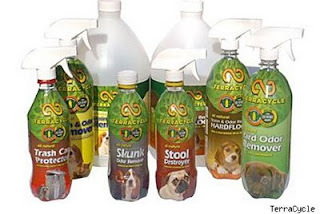 While their flagship product is TerraCycle Plant Food, they have recently expanded their line to include pet products which include: Yard Odor Remover, Stain & Odor Remover, Trash Can Protector Spray, Stool Destroyer, Hard Floor & Surface Cleaner, All-Natural Dig Stop & Bird Feeder. Natural and non-toxic (a big plus for pet owners who avoid cleaning products with harsh chemicals)- all of TerraCycle's products are environmentally friendly and packaged in repurposed plastic bottles (so cool!). We recently had a chance to test out some of the products and we can't say enough about how thrilled we were with the results! Despite not containing some of the typical multi-syllabic chemicals we're used to in our cleaning products, TerraCycle's sprays did the job and didn't leave behind any harsh scents or residues. We particularly loved the Hard Floor & Surface Cleaner which with a few sprays cleaned up one recent little accident (ahem, Paddington). The Yard Odor Remover also tackled a little mishap on our new apartment terrace and left it looking clean and smelling like... well, nothing- which is what we were aiming for! Best yet- as environmentally conscious consumers, we don't feel as guilty when we embark on a zealous cleaning mission using these bio-degradable products! Being in the city- we couldn't perform the extreme tests that we wanted, so we have sent the Trash Can Protector Spray and Stool Destroyer out to Jersey for some intense field trials. (Oh yeah...) So please stay tuned for the results in the next week or so! Make sure to check out TerraCycle's website to read about some of the cool new projects they're embarking on and their great line of products (everything from plant specific fertilizers to rain barrels!). You can pick up TerraCycle's pet line from PetCo.com! p.s. We also tried out TerraCycle's Worm Poop Fertilizer- absolutely amazing!!! It totally revived our semi-dead ivy and lavender plants! !